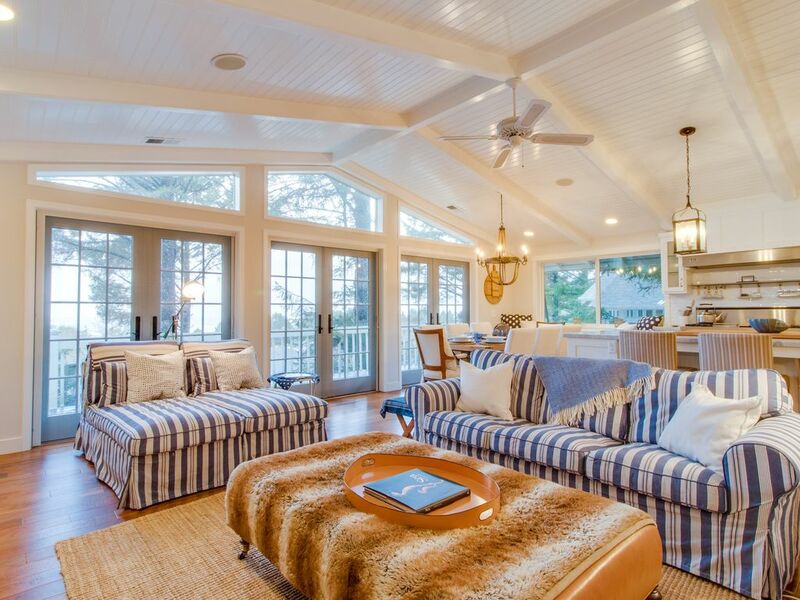 Add a touch of the east coast to your next Oregon Coast getaway with a stay in this beautiful Hamptons-inspired home! Elegantly designed and comfortably furnished, this lovely vacation rental is outfitted with three floors of amenities, from a game room and a gourmet kitchen to an opulent master suite and a huge deck with ocean views. From family vacations to couples retreats, the South Hampton House is sure to impress. This home is located in the quiet Tolovana Beach neighborhood about half a mile from the beach, hemmed in by a serene old-growth forest. You'll be just a few minutes by car or foot from the white sands and majestic surf of the Pacific Ocean, where you can kite-surf in the waves, watch for whales, or enjoy a bowl of fresh chowder from Pelican Brewing in town. Downtown Cannon Beach is just two miles to the north, and the winding trails and sweeping views of Ecola State Park lie just beyond. Handsome hardwoods, elevated ceilings, and chic white paneling give this home a classic New England character. On sunny days, extensive west-facing windows fill the living room with natural light, and the giant deck provides beautiful glimpses of the ocean in the distance. The chef in the family will love fixing meals in the spacious gourmet kitchen, which is outfitted with sleek gas appliances, a wine cooler, and a large kitchen island with Carrara marble countertops. When the weather turns cold and the Northwest drizzle starts to fall, curl up in front of the gas fireplace with a blanket and a good book, or head downstairs for a game of foosball or air basketball in the game room. If you'd prefer some privacy, the stunning master bedroom suite has its own deck and indoor sitting area, plus a private bathroom with a gas fireplace! Open a bottle of wine and sink into the tub for a truly luxurious experience. There's no better way to enjoy the Oregon Coast than a stay in this stylish rental. Book your reservation today for a vacation you'll never forget! Parking Notes: Driveway can accommodate 4-6 cars depending on size of all vehicles. Water Access: This home is on half mile from beach access. So spacious, several balconies. Had electric fireplaces, steamed shower, towel warmers, the works. Will consider again. The house was spectacular and the master bedroom was truly incredible. Steam shower and fireplaces were fantastic. This home was lovely, warm and inviting. Had plenty of room for us to relax and have a fun time together. Absolutely stunning home. Gorgeous layout and incredible attention to detail in terms of furnishings. Loved every minute. Vacasa is a lovely service as well which makes everything easier. Our stay couldn’t have been better. This beautiful home has a lot of extras that made our stay beyond our expectations. The view and sound of the ocean from the living room and deck enhanced our stay. It was an easy walk to the beach and located in a quiet neighborhood. I recommend this home for a family or a couple who want a romantic getaway. This home is absolutely amazing!! Chef’s kitchen, inredible master bath with steam shower and large tub. Awesome wraparound deck on every floor with beautiful view of the ocean and set amongst the trees. Honestly, the most gorgeous home I’ve ever set foot in! We didn’t want to leave! The only other thing we could possibly want is WiFi. It was nice to disconnect from reality and just enjoy our surroundings. We will be back!